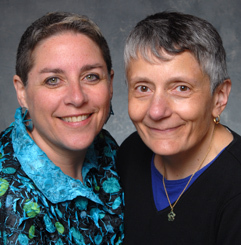 Berman ( left ) and Cuzzillo have worked for decades on lesbian and AIDS issues. They have been together since April 1, 1977. Berman is a Change Management Consultant with Deloitte. Cuzzillo is a Business Systems Analyst at the University Of Chicago. •	Berman has been a board member with: Thousand Waves, IMPACT, the Mayor’s Committee for Gay and Lesbian Issues and the Non-Profit Financial Assistance Center. She has also volunteered with Horizons, Blazing Star newspaper, United Way, the Chicago Department of Health’s AIDS funding committee, and numerous other AIDS groups. Berman is also a founder of the AIDS Foundation of Chicago, and the Hispanic AIDS Network. She also taught gay and lesbian counseling graduate classes at University of Chicago, School of Social Service Administration and the Illinois School for Professional psychology; and had a private practice in psychotherapy specializing in gay/lesbian counseling with individuals, couples and groups. She developed some of the first HIV programming for Horizons ( now Center on Halsted Street ) , Travelers and Immigrants Aid ( now Heartland Alliance ) and the University of Illinois at Chicago. In recognition of her achievements, Caryn was inducted into the Chicago Gay and Lesbian Hall of Fame in 1995. Cuzzillo served on the board of Lesbian Community Cancer project and Thousand Waves. She was a key volunteer with Blazing Star newspaper and the Horizons Youth Group and Speakers Bureau, and served on the University of Chicago GLBT Faculty and Staff Committee.